“Our calendar this weekend is clear,” my wife, September, informed me as I walked through the front door, returning from work. “We should take your shiny new toy to Tahoe and go hiking.” I had just parked our new BMW i3 in the driveway. It had less than 1,000 miles on it. Her eyes pierced the slack-jawed look I was wearing. “But the new car has a gasoline engine in it,” she said. I wasn’t sure if she was asking a question or making a statement. “Yeah, it does, but…” I fumbled for the most economical response I could think of. “Remember the little Honda we had when we first got married? That.” Over the years the severely under-powered Honda was often referred to derisively when discussing road-trips. She knew I meant that the i3 couldn’t tackle a mountain. Maybe I had conveniently forgotten to mention that when we talked about buying it. An EV for the Masses. Almost. Electric Vehicles (EVs) have been lurking in the shadow of the Internal Combustion Engine (ICE) cars for decades. Some EV advocates would have us believe the time is ripe for EVs to become mainstream. Sales figures make it clear that EVs are hot in many regions in the country. It's pretty clear that EVs are here to stay and gaining market share. But that doesn't mean EVs are ready for the heartland. Two things need to happen before EVs truly go mainstream. The first is sufficient infrastructure needs to be deployed so those drivers who do not control their parking spot every night can still charge their car; that’s a topic for another day. The second thing that needs to happen is to engineer into the EV enough flexibility so that the potential buyer has confidence the car can fulfill all of his or her needs. Not most. All. This is especially true if the potential buyer is buying a car that will be their only car. It’s not about range anxiety; not exactly, anyway. And it’s not about just slapping in a bigger battery. The driving public isn’t going to embrace a Battery Electric Vehicle (BEV) until adding energy is as thoughtlessly and effortlessly accomplished as is adding energy to an old-fashioned ICE-mobile. The Battery extended range Electric Vehicle (BEVx) changes this. Almost. What the Heck is a BEVx, Anyway? When people think of a Plug-in Hybrid Electric Vehicle (PHEV) they may think of a Chevy Volt or a Plug-in Prius. PHEV’s typically have 40 miles or less of All Electric Range (AER) and have what one might call a “normal-sized” engine that is connected to a transmission which then mechanically drives the wheels when the battery is exhausted. This is not how the BEVx works. The BEVx classification is differentiated from the PHEV, like the Volt, by virtue that the Auxiliary Power Unit (APU) is not mechanically connected to the driving wheels, rather its purpose is solely to generate electricity to extend the AER beyond what the manufacturer engineered in. For an EV to be classified as BEVx under California Air resources Board’s (CARB’s) official designation, one important factor is that the available range while operating with the APU must be less than or equal to the AER. There is another important distinction of the BEVx class, which we will discuss in a moment. The BEVx is essentially an all-electric vehicle but the APU and on-board generator combine to extend the AER once the battery is depleted. Taken together, the APU and the on-board generator are called the Range Extender, or REx. As mentioned above there is an additional important aspect the defines CARB’s BEVx designation -- the APU is constrained by regulation to turn on only when the battery falls below 6.5% State of Charge (SOC), shutting off once its SOC rises above 6.5%. 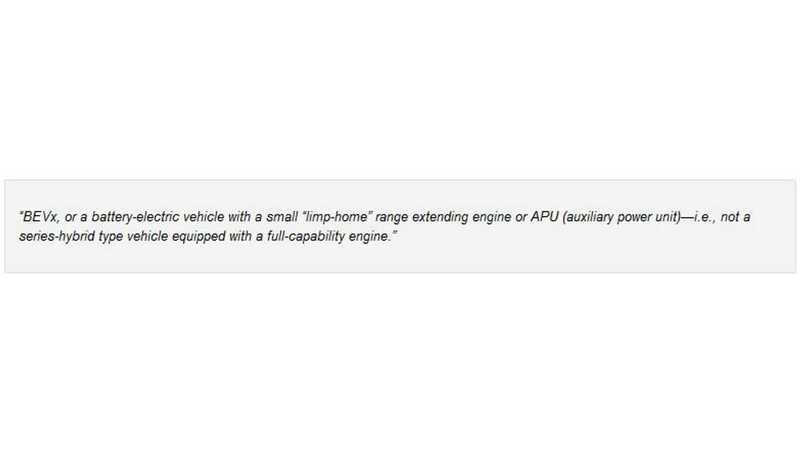 This artificial constraint on how the APU manages the SOC means that a BEVx class car comes oh so close to being the only car a driver may ever need, but it fails for one important use case. This is a travesty for anyone who wants to see the electrification of the modern automobile, because it just doesn't have to be this way. The APU has seemingly conflicting requirements to be as small and light as possible while also having sufficient power so that the car can be useful. The logical manifestation is an APU with sufficient power to propel the car at freeway speeds. But a problem arises when freeway speeds need to maintained while simultaneously making sustained elevation gains. BMW’s i3 Rex is the only car manufactured to the BEVx spec to date. For the i3, 6.5% SOC is 1 kWh. It has been shown that 1 kWh is equivalent to about 750 feet of elevation gain. It follows that when the REx kicks in, you can climb 750 feet. If you need any more than that, you going to be doing something that is loosely referred to as Turtle Mode. Interestingly, it has also been shown that if the REx were allowed to turn on on at a higher SOC than 6.5%, the i3 could conquer any pass in North America. To propel the car at freeway speeds while simultaneously climbing a significant grade would require a much more powerful (ergo larger and more massive) APU. Sure, the APU could be 200 HP, but this would be the motoring equivalent of driving in a thumbtack with a sledgehammer, as the i3 only requires 35 BHP to maintain 80 MPH on level ground. In order to climb a hill at freeway speeds, any BEVx will need to dip into the battery’s stored energy; if your drive includes a climb, it has to come out of the battery. This is where CARB's BEVx regulations are problematic. For the specific case of the i3, if you never plan on driving anywhere that might include an elevation gain of more than 750 feet, fret not. It is truly a transitional vehicle bridging the gap from ICE to BEV and has all the spontaneity and long-range capabilities your family may need. As long as you keep its diminutive tank filled, you're golden. Before we go any further let's be clear. CARB's BEVx regulations impact any car that ever will be manufactured to this specification, and not just in California. For the BMW i3 REx, for example, the BEVx limitations apply to every vehicle sold in North America. Including Canada. The BEVx is a great way to assuage range anxiety if you're considering an EV. But if you want your shiny new EV to be the only car your family needs, proceed with caution. Some say the BEVx was never intended to be a car with mass appeal that can be driven like any ICE-mobile. But I ask, why not? Actually, what I usually say is “Why the hell not!” while shouting and pounding the table with my fist. I digress. I believe that the BEVx class of cars represents the bridge from plain ol' ICE-mobiles to pure electric that will finally allow the public to embrace EVs without looking back. Except. The exception that we’ve been discussing is what engineers call a "corner case." In this situation the “corner case” refers to those people who require a car to maintain freeway speeds over sustained elevation gains. Let me provide an example using BMW’s i3 (as the only BEVx on the planet) to demonstrate my point. California's San Francisco Bay Area lies at sea level and the drive east to Lake Tahoe follows the Sacramento river, never gaining significant altitude for about 50 to 100 miles, depending on one's starting location. Continuing east past the capital of Sacramento begins what is at first a gentle climb into Gold Country. Assuming the route is along I-80, the slope increases significantly past Gold Country until Donner Summit (elevation 7,228 feet) is reached 95 miles east of Sacramento. It’s simply not possible to drive from the SF Bay Area to Tahoe in a reasonable amount of time with the US spec’d i3 without using the REx. 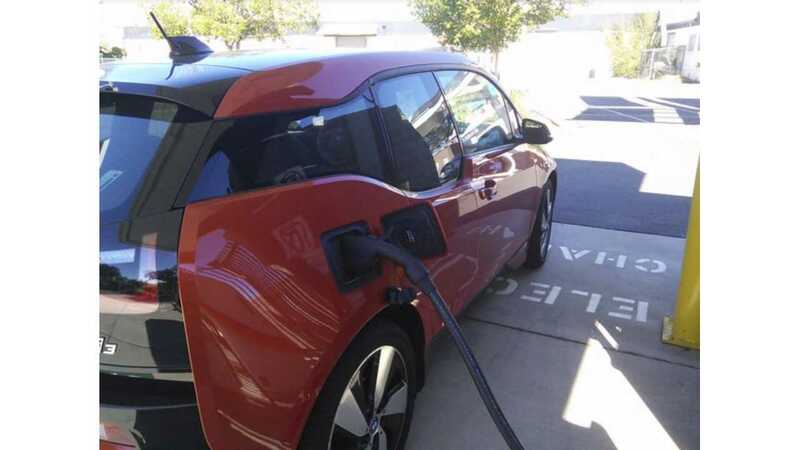 Of course if you have the patience to charge every 60 to 80 miles, you can drive your i3 from the Bay Area to Tahoe or anywhere else for that matter. But that is impractical, even with with so-called fast chargers. 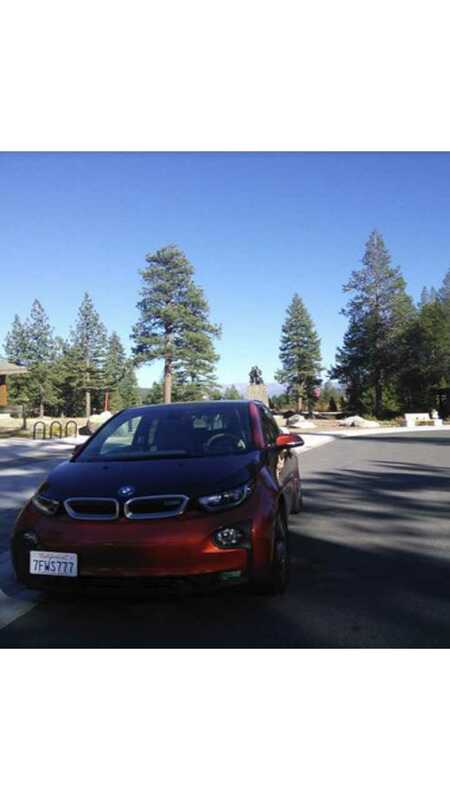 I drive the BMW i3 from my home in Mountain View, California to Donner Memorial Park in Truckee. The state park is placed at one of the sites where the ill-fated Donner Party settled for the winter in 1846. The snow that winter was as high as the memorial behind the i3. I’ve asserted that such a drive is simply not possible in a US spec i3 without becoming speed limited. How speed limited is a function of the slope of the road as discussed in this post. But what would happen if CARB’s artificial limitation on the BEVx was removed? It just so happens that the European manifestation of the i3 is a perfect comparison tool. To learn how the Yankee version of the i3 compares to it’s schnitzel eating cousin, I’ll take two test drives. The first I’ll call The Apple Pie Test and the second The Lederhosen Test. The purpose of these tests isn’t to prove you can drive an i3 to Tahoe by taking logical opportunities to charge. You can. It’s been done. The purpose is to prove the assertions the US-spec’d i3 REx is hobbled as compared to its European counterpart and second (and more importantly) that an i3 REx is more than a great EV; it has potential to be the only car you need. The Apple Pie Test is simple: try to “REx it” to Tahoe and see how far you get. (Oh, I’ve made REx a verb, but the Oxford dictionary hasn't caught up yet.) Since this is my test, I get to make up the rules. The rule is simply to take a BMW i3 REx as CARB intended it to be delivered to the public and drive it along I-80 until the car becomes speed limited. To do this test I left the Benicia, California, CCS fast-charger with 90% SOC and a predicted range of 60 miles. The drive toward the Tahoe region is essentially flat for about 63 miles along I-80, then the road climbs into the Sierra Nevada mountains. I planned this section of the drive to be all electric until such time I hit the foothills. The goal was to set the cruise control to the posted speed limit (65 MPH) and simply keep driving powered by the REx until the car became speed limited. At first the speed limitation was subtle. I started to suspect the car was speed limited at around 800 feet elevation (750 gained); “flooring it" to coerce an increase from 65 MPH with the cruise control set, I achieved about 67 or 68 but no more. But by 950 feet elevation gain the effect was no longer subtle. Not only could I no longer keep pace with traffic, but was feeling very vulnerable and searching for an exit in earnest. On some of the steeper portions of that section I was under 55 MPH indicated with traffic whizzing past at 70 MPH and above. Anyone who has owned a BMW for very long can tell you that the speedometers are optimistic by at least 5%, if not 7%. So, that 58 MPH in the photo is closer to an actual speed of 55 MPH. On steeper section the i3 would have been limited to less than 50 MPH; this has been corroborated by legions of i3 owners who have tried similar drives around the world. This demonstrates that you can’t just REx it to Lake Tahoe in an i3. Luckily, there is a CCS fast-charger in Sacramento, so moments after the above photos were taken I turned around and headed straight for it. With the miracle of regeneration the i3 got its SOC back up to a respectable level and I REx’d it all the way back to that CCS charger with no issues. The Lederhosen Test requires the use of a feature known as “Hold Mode”, which is on all Euro-spec i3 equipped with the REx; perhaps even all such cars destined for anywhere in the world outside of North America. What Hold Mode does is engage the REx (or more specifically in CARB-speak the APU) to maintain the battery SOC. Sounds a bit boring and perhaps it is. The fact of the matter is, US spec’d cars have Hold Mode; the car’s onboard intelligence switches it on automatically when the battery SOC reaches 6.5%. The European version of the car also will switch on Hold Mode automatically when the battery SOC reaches 6.5%, but the European version also allows the driver to manually engage Hold Mode whenever the battery SOC is 75% or less. The difference in the US spec’d car and its European counterpart is perhaps subtle, but as we shall see, the difference means everything if you require a car to maintain freeways speeds and gain significant elevation simultaneously. What is important here is to understand that the US-spec cars do in fact have the European-spec Hold Mode programmed into the car. 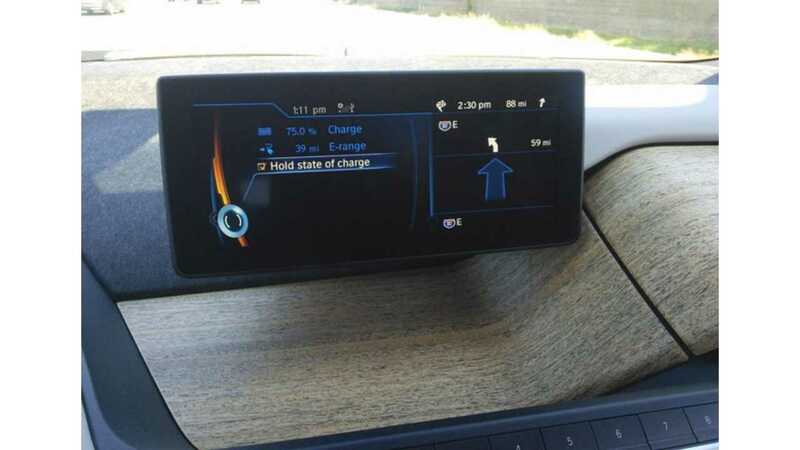 The menu option that allows the driver to engage Hold Mode manually is simply hidden from the i3’s iDrive menu. For someone skilled in the seedy underbelly of the BMW tuner world known as “coding,” enabling this hidden feature in the iDrive menu is trivial. To be clear, this practice is most likely frowned upon by both BMW NA and CARB. To satisfy scientific curiosity, I “coded” my i3 to enable Hold Mode, Euro-style. On to the Lederhosen Test! As noted in the Apple Pie Test, as soon as I became speed-limited near Auburn, I turned around and returned to Sacramento and specifically to the CCS fast-charger. After plugging in and after i3’s SOC had reached 90%, I once again set out along the same route toward my final destination in Truckee, California, near Lake Tahoe. Hold Mode is only available if the SOC is 75% or less, so after leaving the CCS charger I drove the first 12 or 13 miles all electric. The CCS fast-charger in Sacramento in Sacramento is at an elevation of 50 feet. The only difference in the two drives was the SOC at the bottom of the hill and manually engaging Hold Mode. This simply means the REx was used in the Apple Pie Test to “hold” a 6.5% SOC but on the Lederhosen Test, it was used to “hold” a 75% SOC. Engaging Hold Mode at 75%. Note there are 88 miles to my destination, with 39 miles of all-electric range available. 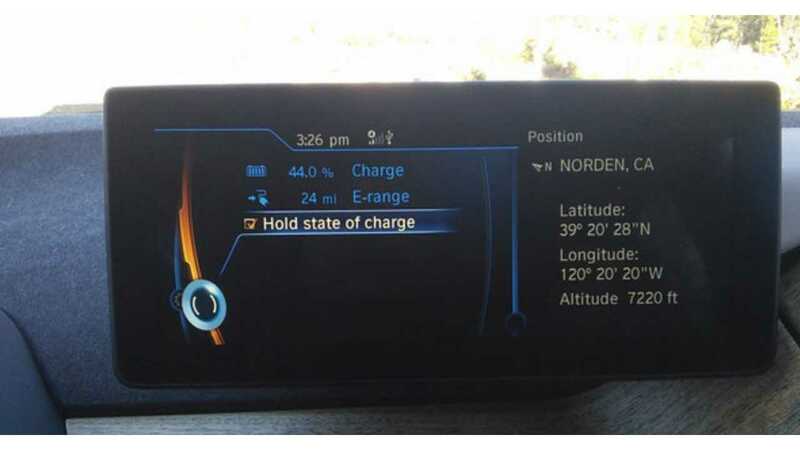 With Hold Mode engaged, as one drives the i3 the REx keeps the battery SOC constant at the level set. If driving conditions are such that the REx (due to its limited power output) cannot keep the battery SOC maintained, then energy from the battery makes up the difference and the battery SOC falls commensurately. It was the perfect day for such a drive; the sky was a beautiful blue, the temperature was in the mid 70’s, the traffic light and SiriusXM’s Classic Vinyl accompanied me. 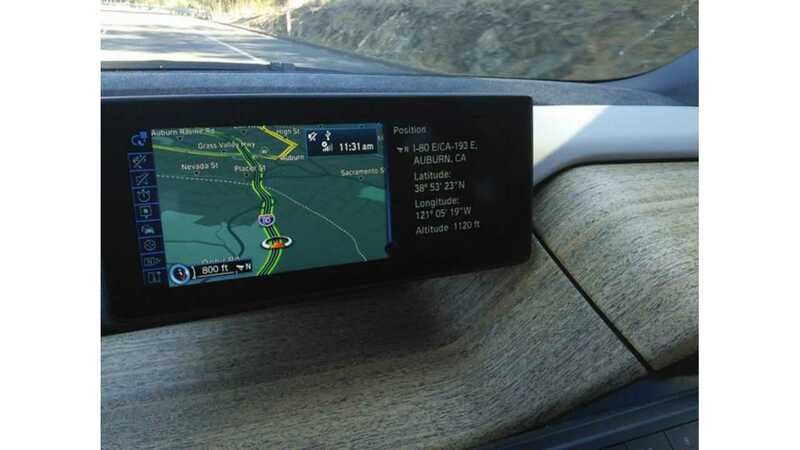 During the drive I took pictures of the i3’s displays every 1,000 feet of elevation gain, but suffice it to say that the battery SOC slowly dropped in an expected and predictable fashion as I glided up the mountain's slope. Not once did the car fail to maintain the 65 MPH that I had set on the cruise control. No one from The Guinness Book of World Records greeted me when I arrived at Donner Summit, but I’m pretty sure mine was the first i3 to make that drive using the REx. The i3’s other “fast charge” port. I don’t like to use this method of adding energy, but sometimes a guy’s gotta do what a guy’s gotta do. 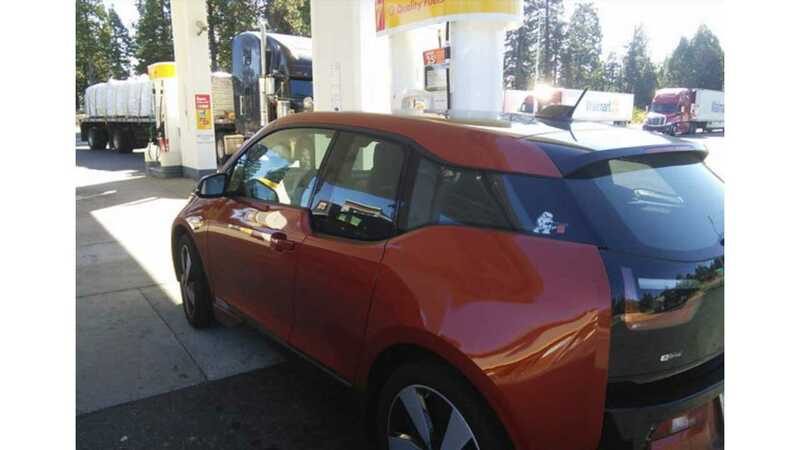 The i3, with Hold Mode engaged, used a mere 31% (75% at the bottom of the hill less 44% at the summit) of its SOC to gain nearly 7,200 feet of elevation. In simple terms, one can think of it as if the REx’s power output is used to propel the car forward, the battery’s power output is used to climb the hill. By using less than a third of its battery to gain those 7,228 feet, the i3 REx is obviously capable of much more. In this post I asserted that the i3 with the European-style Hold Mode was probably capable of summiting any road in North America. After making the drive over the Sierra Nevada’s I-80, I believe that point has been verified. 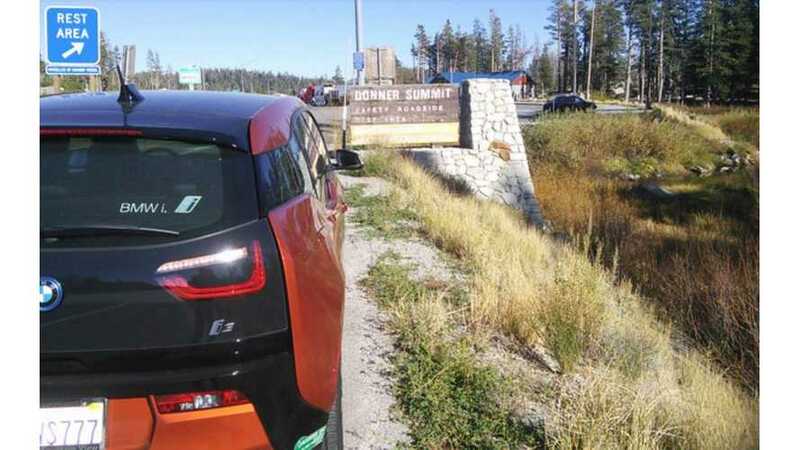 The i3 REx with the European-style Hold Mode is more than capable of conquering Donner Summit simply by engaging the feature at the beginning of the climb and keeping the tank filled. The US spec i3 REx is not. But the implications are far greater than this. The entire thesis of this article is much larger in scope than “can BMW’s i3 make the drive to Lake Tahoe.” The thesis is much more than the car or the corporation. It’s about an idea. A brilliant idea. It’s about a transitional electric vehicle that the public can embrace without looking back, without asterisks and without range anxiety. The embodiment of that transitional electric vehicle is the BEVx class. 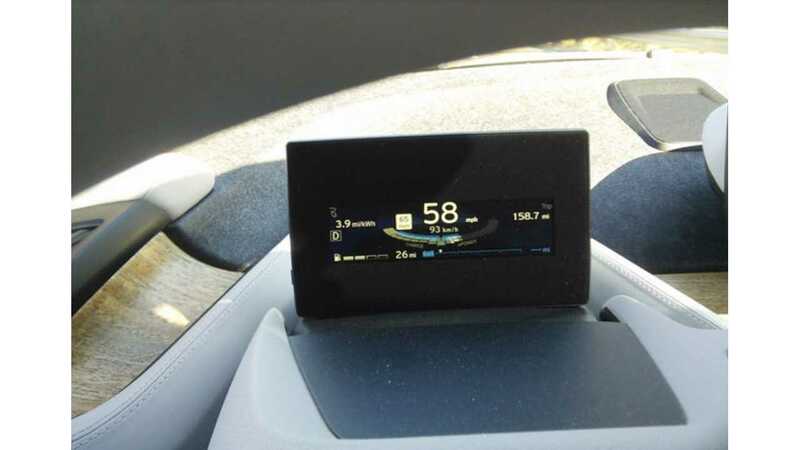 The corner case I tested in both the Apple Pie Test and the Lederhosen Test, that the i3 is fully capable of, may be an inconsequential corner case for the majority of owners worldwide. But it is a legitimate use case and one that the many buyers consider. And the public makes purchasing decisions based on the corner case, especially if it is their only means of transportation. Until such time that adding energy to an EV takes as much thought and effort as adding energy to an ICE-mobile, technologies like the BEVx are going to be required to get the public to embrace electric mobility. The infrastructure for BEVs just isn’t there yet, so the car that best fills the role of “being transitional” is the car that will finally allow the public to embrace zero-emissions vehicles and drive the maximum number of zero-emission miles. The BEVx addresses this issue. To date only one car is made to that standard. It’s a brilliant piece of engineering. Yet that brilliant piece of engineering is emasculated by regulations imposed by a governing body that should be championing it. I’m surprised that Sir Isaac Newton hasn’t leapt from his grave and set his hair on fire. If removing the restriction on the operation of the APU is not made, the genius of the BEVx classification will never bear fruit. That’s because even though the average driver does less than 40 miles a day, they also want the flexibility to take their car wherever they want, whenever they want. For this reason, PHEVs are about as “electric” as the general public is willing to go. Once the current limitation of the APU software managing the SOC is understood by the public, the public will eschew the BEVx classification for PHEVs, such as a Volt. While that may be a better choice for the environment than, say, a Camry, the Volt driver will not be able to drive as much on electricity as if he bought a BEVx, such as an i3. That’s why I’m writing; to beg CARB to Unleash the REx. It’s been said that the PEHV is the gateway drug to a pure BEV. If that is so, the BEVx has the potential to be crack -- instantly addictive. Make it so.